The third of the Workshop DLC packs for Fallout 4, the Vault-Tec Workshop promises a deeper experience than the previous releases. Literally. The majority of the new content is gear around finishing the construction of Vault 88, a fallout shelter that wasn't quite ready for the end of the world. Vault-Tec Workshop promises all the perks of pre-war America. Advanced technology, comfortable furniture, and of course, ethically dubious experimentation and social engineering. While players will likely find the new digs comfortable and the workshop options exciting, the more intriguing scientific side of the DLC is sadly lacking. 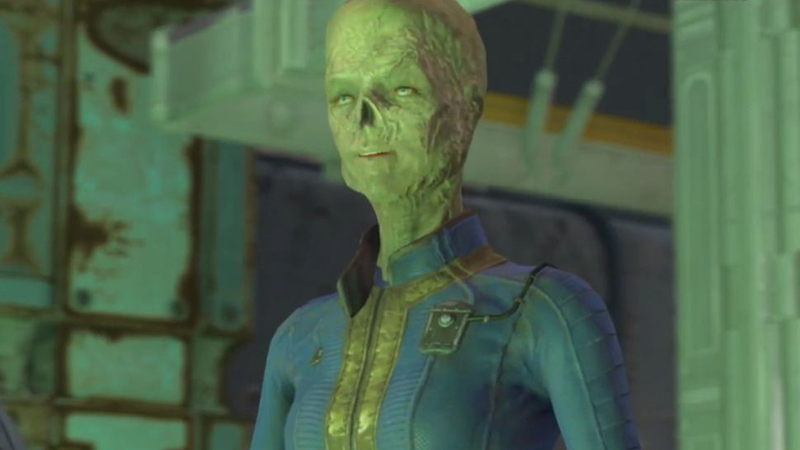 The Vault-Tec Workshop isn't exactly MKUltra. It's more like an overly intense corporate team-building exercise. Still terrifying, but not in a fun way. Unlike the previous Workshop DLCs, Vault-Tec requires a little more work than simply opening up the Workbench editor at a settlement. Claiming Vault 88 will require players to wrest it from the hands of a band of Raider squatters surrounding the area and perform a few tasks for the current Overseer. The questline isn't particularly long or interesting, but it gives you a chance to stretch your legs, shoot a few things, and laugh at some gallows humor. Still, even a mediocre quest is better than no quest at all. An odd thing that needs to be addressed right away is that many of the features that were hyped or implied in earlier promotional materials for the DLC didn't actually make the final product. While the trailer may say “experiment on dwellers” and show a line of exercise bikes being peddled by motivated vault citizens, the actual scope of those tests are much more limited than implied. 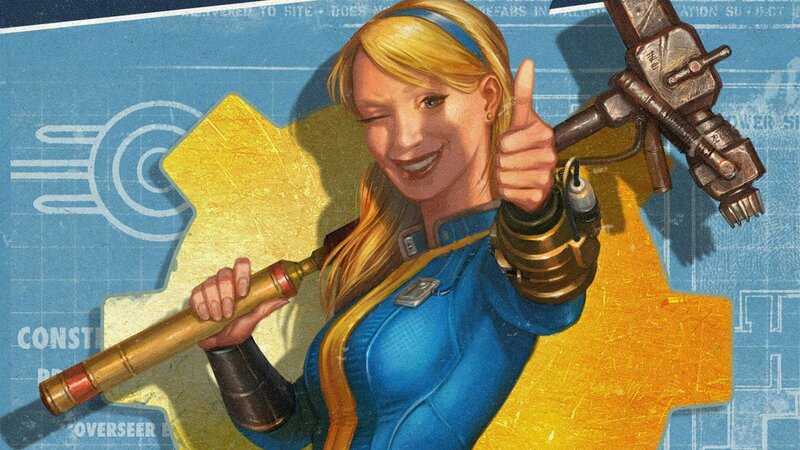 A series of quests will allow you to conduct a series of Vault-Tec's classically dubious tests, but they are a one-time special event focusing on just one witless NPC (a hick specifically designated as the group's guinea pig). After he's run through the available tests, that's the end of the grand scientific journey. Anyone hoping to run long-term studies or shape the culture of their vault will be sadly disappointed. Similarly, earlier promotional material indicated that overly-involved Overseer's would be able to change the appearance of their settlers with a new surgery lab and barber chair. While those items are available, the only person you can give a nip, tuck, and trim to is your own character. Pity, I was hoping to get a whole cult vibe going on by giving everybody matching buzz cuts. 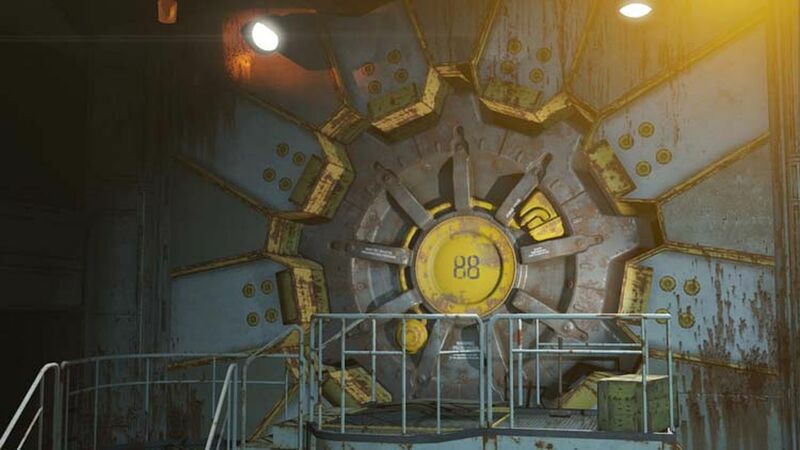 While it's disappointing that the DLC doesn't deliver on some of the expected features, one thing that can't be argued with is the size of Vault 88. The underground space is truly massive. Players will need to tour the grounds and clear out all the Ghouls and Radscorpions before being able to use it all, but even the starting zone is more than large enough to build an impressively sized vault. Fortunately, players will be more than well equipped when they want to start messing with the new Vault themed walls, rooms, and corridors. Vault 88 comes stocked with a suspiciously large amount of high-value clutter to scrap such as train cars, construction equipment, and raw chunks of uranium in the walls. It's almost as if Bethesda finally realized that having to run around and pick up three dozen hot plates and a kitchen counter worth of old coffee cups just to build a shack isn't much fun. If you're a settlement freak like me, the wealth of easy to harvest scrap makes the DLC worth it almost on its own (a statement that is more than slightly sad now that I say it out loud). The new Vault themed building sets are surprisingly varied and robust. There are different colored panels for domestic and industrial zones (even with cute bifurcated hallways to transition between zones). There are large hanger style hallways for a militarized look and specially decorated room pieces for dinners, nurseries, and offices for more civilized Overseer's who want to play dollhouse. The large atrium pieces are especially handy for quickly building an impressive looking living space. Unfortunately, the construction editor has not been adapted or improved to deal with the more demanding architecture. It's as clumsy as ever and only seems even more flawed when the Lego-like pieces of the vault set fail to clip together properly. With patience and persistence it is possible to create some interesting floor plans, but it takes far more effort than it should thanks to the fussiness of the editor. It's the small improvements that really redeem the Vault-Tec Workshop. Outside of the flashy vault pieces and lackluster experiment sets, the DLC includes a bevy of much-welcomed crafting items and small accessories. Alternate guard posts and security offices for players who are tired of setting up the same flimsy wood and rubber barriers in every settlement. Little pieces, such as cozy dinner seats, new Vault-Tec branded posters, and clean versions of several already existing pieces of furniture all help flesh out the construction set. You can finally sleep in a bed that doesn't look embarrassingly stained. One of the best small improvements is the Vault-Tec population control terminal. This handy little device is basically a partial recreation of the popular Settlement Management mod. It allows today's on-the-go Overseer to get a overview of a settlement's population, check who is on what jobs, and assign tasks remotely. Best of all, the VIP tracker will locate any lost companion and highlight them on your map. Perfect when you can't remember what ditch you left Paladin Danse in (you know, so you can avoid the area and continue to ghost him). 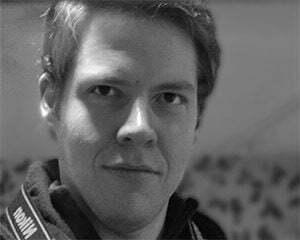 While it is hard to get excited for something that has been available as a mod for PC players for months now, jealous console players (particularly PS4 players) will likely appreciate the gesture. It's good to see Bethesda is paying attention to the community, actively identifying what players are interested and officially adopting some of the better ideas. Vault-Tec Workshop finds a more comfortable middle ground between the previous workshop expansions. Wasteland Workshop seemed lazy and half-hearted. A paltry number of new items aimed at servicing needs nobody was particularly interested that barely worked even when you set them up (the neon lights are still the best part of that DLC). The Contraptions Workshop was conceptually ambitious, boasting a huge number of tools and new items that engaged the mechanics of the game in interesting ways. But, it was largely impractical -- a collection of novelties you might tinker with once and never use again. Vault-Tec Workshop has comparatively modest aims. It isn't as wild as Contraptions, but offers more than Wasteland did. 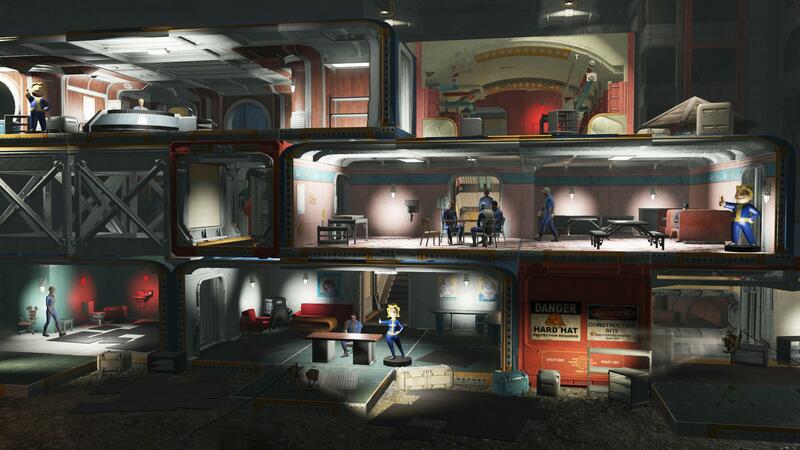 Creating a vault shelter might not be as flashy as taming Deathclaws or setting up factory lines to move scrap around, but the appeal is much more apparent and lasting. It flubs the big ticket features, but makes up for it with solid quality of life improvements and a few interesting quests. For whatever it is worth (and the value of Fallout 4's Season Pass is still very dubious) Vault-Tec Workshop is the best of the Workshop packs.